Trinity Alps Chamber Players. Photo by Phil Nelson. Festival director Ian Scarfe will be joined by violinist Edwin Huizinga, violist Stephen Fine, and cellist Hannah Addario-Berry for a special preview of the Trinity Alps Chamber Music Festival’s 2014 Summer Programs. Held in the scenic Trinity Alps Wilderness from June 15-30, this summer’s programming includes one weekend devoted to the chamber music of Brahms, and a second weekend featuring Aaron Copland’s Pulitzer Prize-winning Appalachian Spring, in its original version for chamber ensemble. SFMusic Thursdays are an outgrowth of San Francisco Friends of Chamber Music’s acclaimed annual event, SFMusic Day . Live + Free. This new bi-weekly series extends the reach of that celebration of the Bay Area’s vibrant, eclectic music scene year-round. 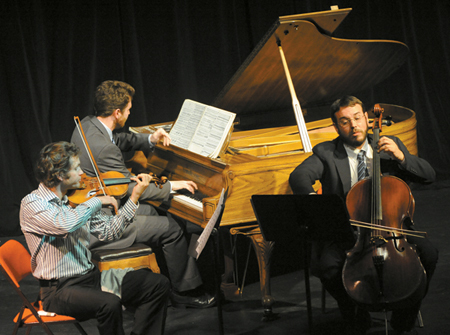 Small ensembles in the SFFCM community – excellent and ambitious performers of Early Music, Chamber Music, New Music, Jazz and Creative Music – are free to present, on their own terms, concert programs in the uniquely intimate and accessible environment of C4NM.